With a title like The Serpent and the Rainbow this book doesn't sound like a real life zombi hunting adventure featuring secret societies, deadly poisons and exotic locations. But it is. One day in 1972, Wade Davis, tired of his studies in anthropology at Harvard, jabs his finger on a map adorning the wall of a cafe. His finger lands on the upper Amazon and so starts his journey into the Amazon rainforest. He joins an expedition to cross the Darien Gap, trying not to get lost or murdered along the way. There in the depths of the jungle, and in the depths of despair, he encounters his spirit guardian who appears as a Jaguar. And that is just chapter one. After this introduction the book settles quickly on Wade's quest to discover how zombis work. It is 1982 and the story of Clairvirus Narcisse was sweeping the world. Narcisse is a Haitian who claims his brother hired a bokor to turn him into a zombi. Wade's mission is to determine how zombis are made. His knowledge of biological drugs used by various indigenous tribes could help him unearth the secret of the zombi powders. The tale that follows takes you through the history and culture of Haiti. 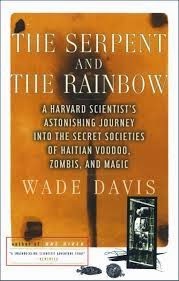 In his own lyrical words Wade enters the heart of the vodou (voodoo) religion where the zombi lurks. As a white man in a black society he slowly gains acceptance by the people and discovers the secrets. The ingredients of the dreaded zombi powders, the secret societies who judge those condemned to become zombis, and why zombis are needed in the first place. Originally published in 1985 this book is considered essential reading for any zombie expert. (Who would have thought that preparing for the zombie apocalypse would involve so much reading?) It is a gripping read that will take you back to the zombi roots and even explain what a zombi's cucumber really is. Bite off more zombi's cucumber that you can chew.